Memorial Day is the traditional start of the cookout season but it’s raining in Chicago, so I’m going to adapt a cookout recipe to make in the oven today, salmon done five different ways. Start with a large piece of salmon, mine was about two and a half pounds. Cut it in half and then cut one of the halves into fourths. 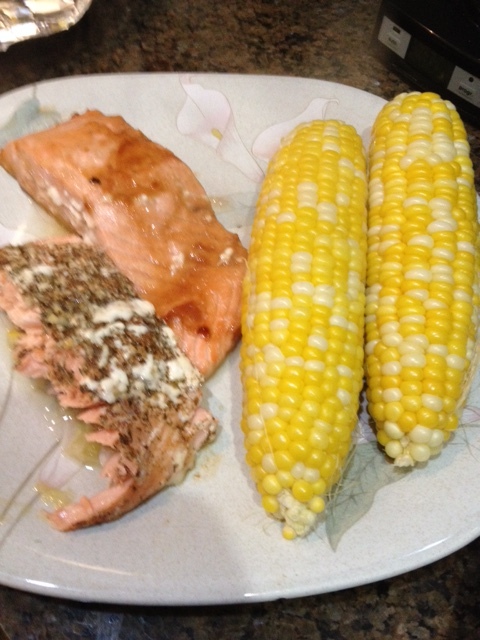 My Memorial Day salmon with corn, these are two of my five preps for the salmon. For the first prep, slice two lemons thinly and line a piece of aluminum foil with them to make a bed for the larger piece of salmon. 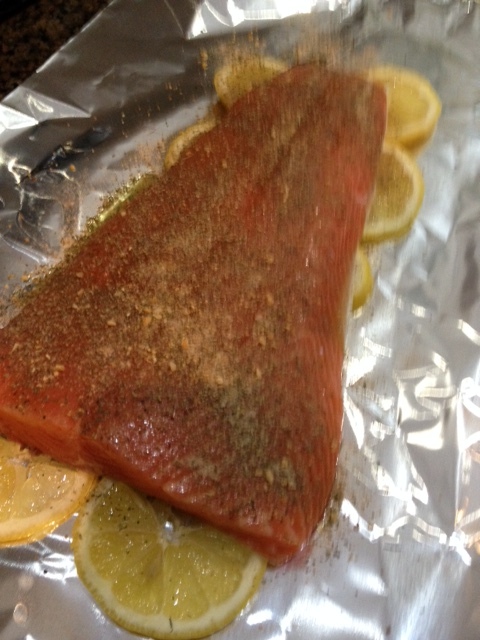 Put the salmon on top, then coat with a lemon-infused olive oil. Cover that with a salt-free spice mixture. I used a Greek spice mix bought from our local Spice House. Wrap that one in aluminum foil and it’s ready to go. For the other pieces, put them on a large piece of aluminum foil as well. Cut some smaller pieces to make little walls between them so sauces don’t migrate from one to the other. For my four, I used Mrs. Dash salt-free teriyaki, garlic and lime and mesquite grill marinades, rubbed into each by hand. On the fourth piece, I used some Mr. Spice honey mustard marinade, also salt-free. 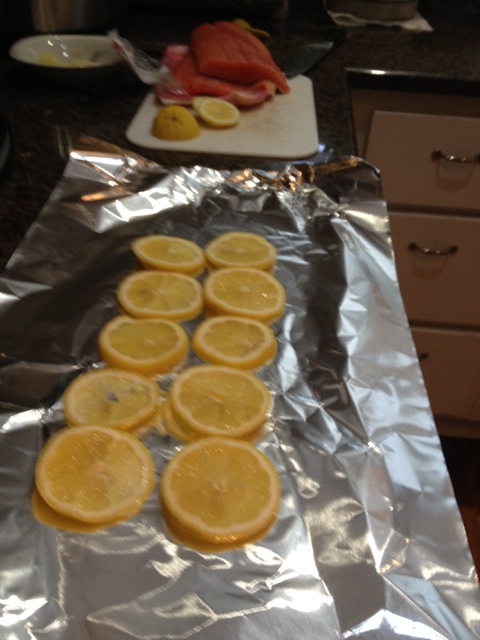 Place salmon on the lemon and coat with lemon-infused olive oil and spices. Wrap those in aluminum foil and put both of your fish on a cookie sheet and into a 450-degree oven. I cooked ours for 30 minutes because my wife likes her fish well-done. 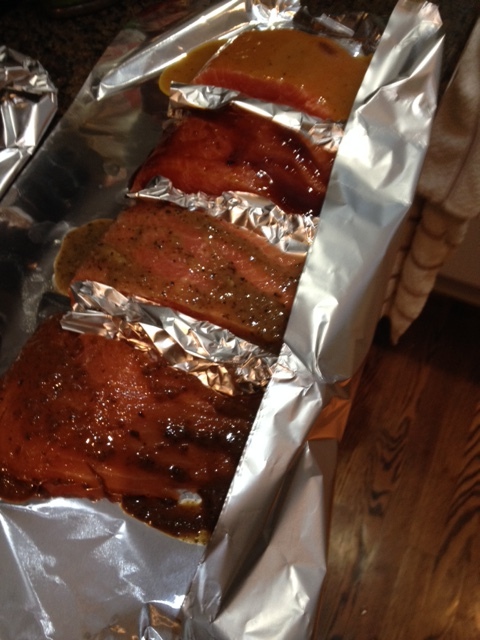 If you enjoy your salmon pink in the middle, cook for less time, perhaps 15 minutes, at which point you should unwrap and check to see if you want to have them in any longer. 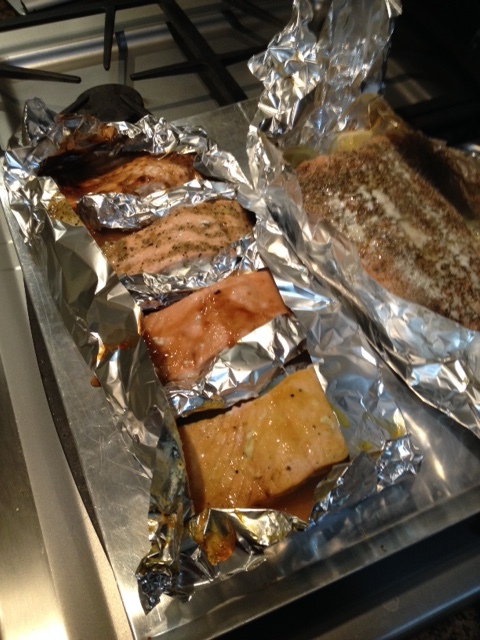 In another sheet of aluminum foil, place your four pieces of salmon and separate with aluminum foil. Then rub in marinades for each. If you do these on an outdoor grill, I’d check sooner, perhaps 15 minutes at most, unless you have great heat control on your grill, something that’s tricky on a charcoal rig but easy on a gas one. Once cooked to your liking, unwrap and you’re ready to serve and enjoy. We had ours with corn on the cob, how Americana is that? Happy Memorial Day everyone, and thank you to all who have served our country!